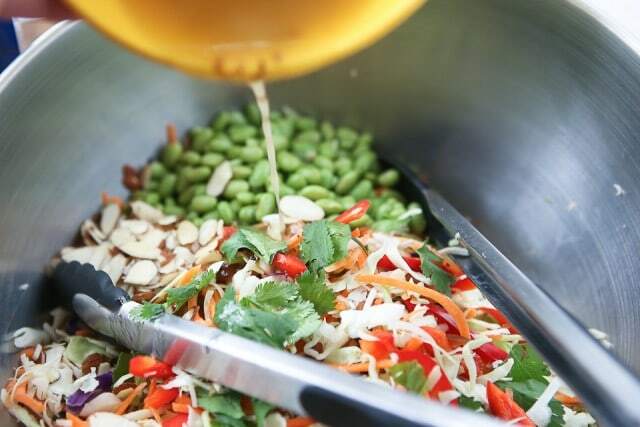 The recipe for Asian Almond Slaw Salad was developed in partnership with Fisher Nuts. Anyone have Spring Fever yet? I think it’s safe to say always have spring fever, for the most part. Our weather situation in Florida is nothing to complain about but I cherish the small pocket of time it feels like spring here, which is right about now. I spent most of this last weekend in the yard trimming landscaping and planning for flowers. Cleaning up my herb pots is next on the list. Nothing feels as good to me as a few hours of work in the sunshine (when it’s not sweltering hot). This is the time of year that I am also ready to get back in the salad. I say that all the time but January is just not a big salad month for me, and I have to be honest, I’m missing raw, crunchy veggies in my life right now. 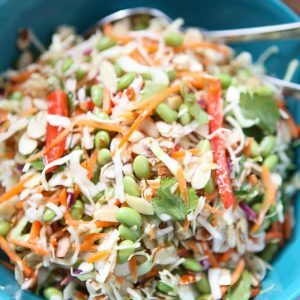 I pulled together this Asian Almond Slaw Salad in honor of getting back in the salad and sharing a heart healthy recipe with you since February is American Heart Month. I think it’s safe to say you already know that fresh fruits and veggies are considered heart healthy foods, but did you know that nuts are too? 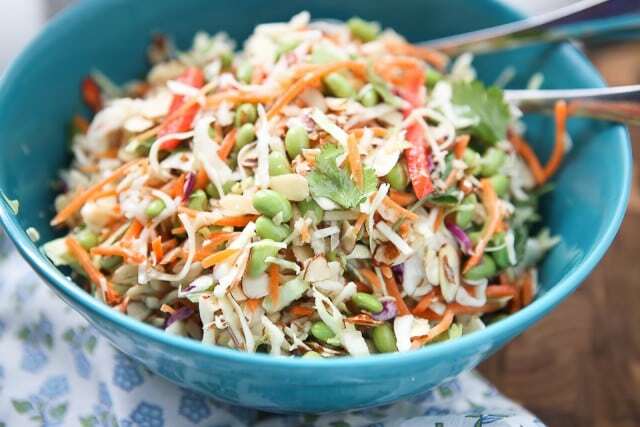 The combination of shredded cabbage, carrots, red bell peppers, cilantro, edamame and almonds really makes a perfect salad – an explosion of fresh flavors and texture. 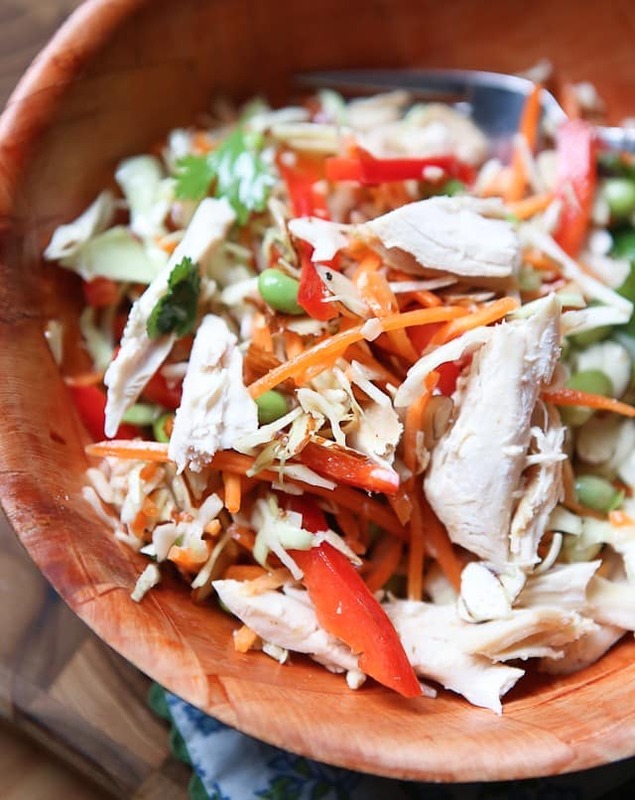 You can’t beat it and you also can’t beat how easy it is to pull together using a few convenience items like from the grocery store like pre-shredded slaw mix, matchstick carrots and (preservative free) Fisher Sliced Almonds. My family enjoyed this for an easy weeknight dinner with some rotisserie chicken, but I can see this salad making an appearance frequently in the upcoming spring and summer months. If you are not serving immediately, be sure to wait to add your dressing until you are ready to serve to prevent it from getting soggy. 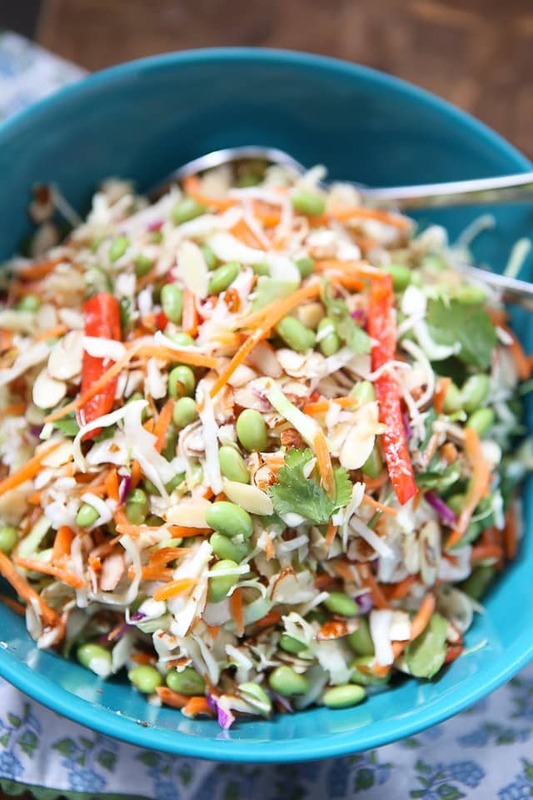 In a large mixing bowl, combine slaw mix, carrots, red bell pepper, Fisher sliced almonds, and edamame. 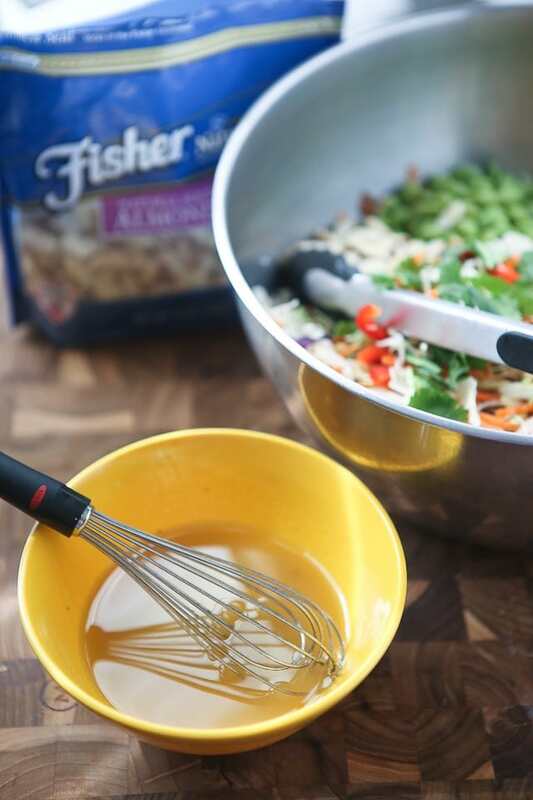 In a small bowls, whisk together rice vinegar, sesame oil, honey, oil and red pepper flakes (if using). Add pinch of salt and pepper to taste. When ready to serve, gently toss slaw salad with freshly torn cilantro leaves and dressing. Do not use all dressing at once, add a little at a time and stop when you feel there's enough. Season salad with a pinch of salt and fresh ground pepper to taste. Serve immediately. This looks 10 toes up, Aggie!!! Girl… You read my mind!! I’ve been having soups for lunch all winter but just today I was thinking I want to switch back to my usual cabbage slaw with rotisserie chicken that i normally eat in the summer!! Bring it on!! that slaw is hard to beat for easy right? I’ve been actually craving soup for the last two weeks! Another light and delicious favorite!!! Aggie, loving this salad. Just need a couple of ingredients and I’ll have dinner on the table in no time! Thank you for always sharing great ideas! Looking delicious, can’t wait to try it out. Thanks! This sounds so good, however, I’m confused about the edamame The recipe says one cup cooked edamame, unshelled. So do you measure out one cup of pods, cook them and then shell them? I’m pretty sure you are not saying to put the pods in the salad…you should only put in the edamame “beans,” right? Help.